Friday tip: Find it difficult to get your LinkedIn profile set up? Let’s work together on that. This entry was posted in Friday tip on January 29, 2016 by kellykoepke. I lived in Germany during my senior year of high school, and went to the German equivalent of high school. I was continually graded down in my English class because I spelled like an American. Good times. This entry was posted in Grammar on January 28, 2016 by kellykoepke. Wise words from one of my favorite authors, Margaret Atwood. This entry was posted in Grammar on January 27, 2016 by kellykoepke. This entry was posted in Web Copy on January 26, 2016 by kellykoepke. This entry was posted in Blog, Brochures, Ghost Writing, Newsletters, Press Releases, Social Media Marketing, Web Copy on January 25, 2016 by kellykoepke. 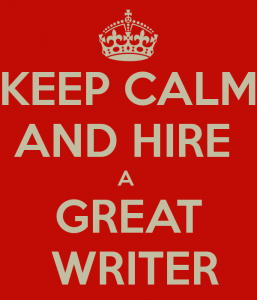 Friday tip: If creating more engaging content a top priority, either become a better writer or hire a professional one. This entry was posted in Friday tip on January 22, 2016 by kellykoepke. Poor writing reflects negatively on a brand. Research from Acrolinx that said the biggest turnoff for more than half of buyers was grammatical errors and bad writing on a website. Get help from a professional. This entry was posted in Blog, Brochures, Ghost Writing, Grammar, Newsletters, Press Releases, Social Media Marketing, Web Copy on January 21, 2016 by kellykoepke. Get started. Or get help. This entry was posted in Uncategorized on January 20, 2016 by kellykoepke. This entry was posted in Uncategorized on January 19, 2016 by kellykoepke. Don’t know the first thing about how to create content for newsletters or social media posts? Writing your own website, blog, articles or social media updates not your cup of tea? Terrified to write it yourself? That’s okay, that’s what I do. This entry was posted in Blog, Brochures, Ghost Writing, Newsletters, Press Releases, Social Media Marketing, Web Copy on January 18, 2016 by kellykoepke.